We hear a lot about super-foods these days. I propose we add watercress to the list. Delicious egg and cress sandwiches are a staple of afternoon tea but this nutrient packed green deserves a little more attention. These pretty little delicate greens with hollow stems grow at the edge of slow moving streams and ponds. Watercress is in the same family as mustard, radish, and wasabi – all known for their peppery zing. My hometown of Huntsville, Alabama was known as “The Watercress Capital of the World” in the early to mid 1900s. This was one of the few places in the country where an abundance of fresh spring-water and limestone, combined with moderate winter temperatures, caused watercress to grow wild and was subsequently cultivated and sold all over the world. These days you can find watercress in your local grocery store. Use this slightly spicy herb to enhance salads, sandwiches, sauces, soups, stuffing, pasta dishes, and more. 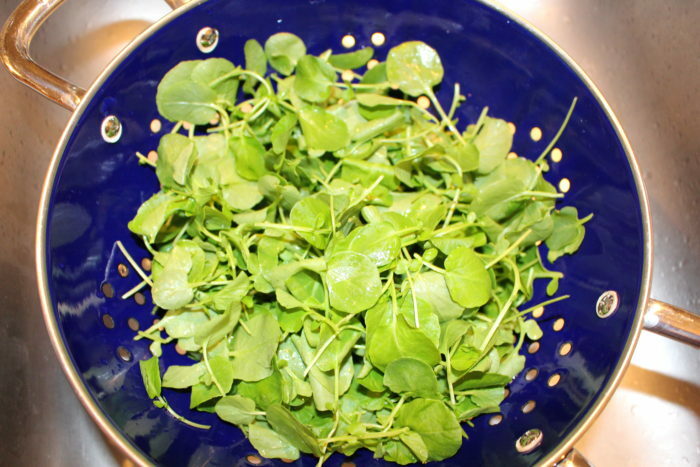 Basically anywhere you use spinach or arugula you can use watercress. I just chopped some up tonight and added it to my spaghetti sauce. Popeye shouldn’t have eaten spinach, he should have eaten watercress. Nutritionally, watercress is chock full of vitamins and minerals. It has Vitamin A, the B-complex group, D, and has long been known as a major source of Vitamin C. So much so that the herbalist John Gerard touted watercress as a remedy for scurvy in 1636. For those who cannot tolerate citrus, watercress is an excellent alternative for vitamin C. Vitamin K, however, is where watercress shines providing more than 100% of the recommended daily amount. (A note of caution: those on blood thinners like Coumadin (Warfarin) are often told to avoid foods high in Vitamin K due to possible drug interactions.) Furthermore, watercress is a rich source of calcium, potassium, magnesium, beta carotene, and omega-3s. It’s good for your eyes, heart, blood pressure, bones and immune system. While there are many claims that certain foods protect against cancer, one study by the American Journal of Clinical Nutrition shows that watercress can reduce the risk of cancer. Another study by researchers at the University of Pittsburgh Cancer Institute found that watercress extract reduced carcinogens in smokers. All this data is certainly intriguing but who knows if it’ll cure cancer, prevent scurvy, and do my laundry all at the same time. I do know it tastes good and is very nutritious so why not have a watercress sandwich at your next afternoon tea?